A tourist visiting Ocho Rios, Jamaica captured a rather stunning phenomenon on camera. Heading inside to take cover from an impending storm, Beckie Bone Dunning from Missouri looked to the skies and was greeted with a sight she had never seen before – a rainbow cloud. She received a response from meteorologist Nick Wiltgen, who explained that the effect is produced by a phenomenon known as iridescence. This is caused when light is diffracted by water droplets and ice particles, causing the various wavelengths – each of which is detected by the human eye as a different color – to spread out. Another tourist, Edmundo Jenez, said on his recent trip to Jamaica he saw three instances over Kingston also in October at approximately 6 am. “It was a chance occasion, happening fast, it started at 6:01 AM and was gone by 6:04 AM,” Jenez said. A rare beauty — a colourful spectacle, as a dissipating high altitude cloud bends the rays of the rising sun. Christopher Hill said he, too, was flying over the island in October and captured this stunning shot. 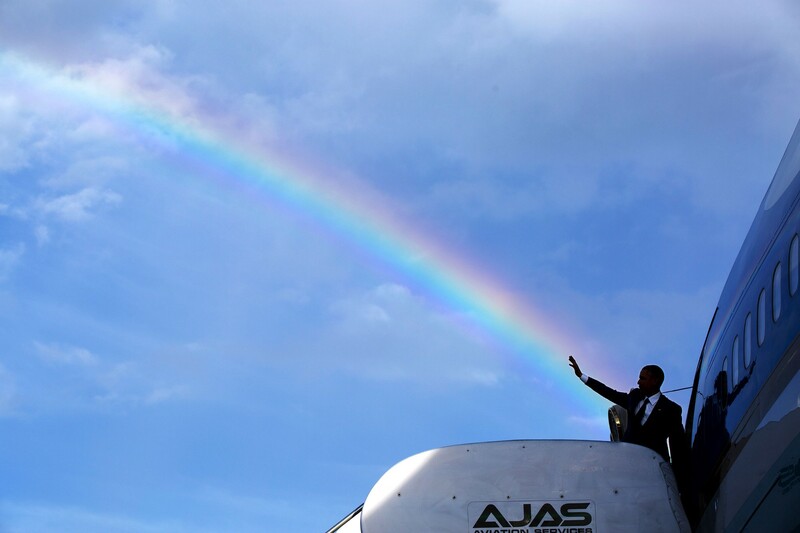 In April, Official White House Photographer by Pete Souza captured this remarkable photo showing President Obama waving goodbye, his hand align with a rainbow as he boards Air Force One at Norman Manley International Airport prior to departure from Kingston, Jamaica.